When you work with us, you can rely on our transparency and professional approach in every respect. 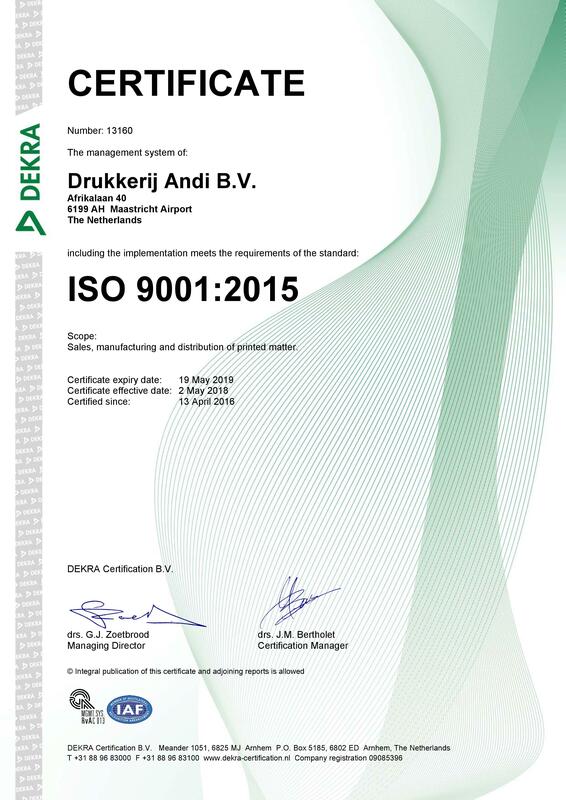 Our vision on quality has been embedded in the company and confirmed in various certifications, including ISO 9001. Our processes are fully compliant with the strictest requirements for medical documentation. Here at Andi, we have a dedicated quality team in place that relies on a documented quality management system. Client audits are not only available, but welcomed, so we can serve your needs even better. Our zero-error policy ensures flawless output, and our services related to medical devices are handled by specially trained personnel. To ensure exceptional quality every step of the way, Andi works with process checklists that include formal release to the next step in the process. Our closed-loop system is based on automated barcode scanning. Printing is our core business; as such, we consider it crucial to handle our primary resource responsibly, so we take responsibly sourced paper very seriously. As part of our environmental policy and our FSC certification, we are proud to advise that you use FSCcertified paper for your printed materials, and include the FSC logo. Adding an FSC logo on your printed materials shows that you care about responsible sourcing, making an immediate and visible contribution to your company’s reputation for embracing sustainability. 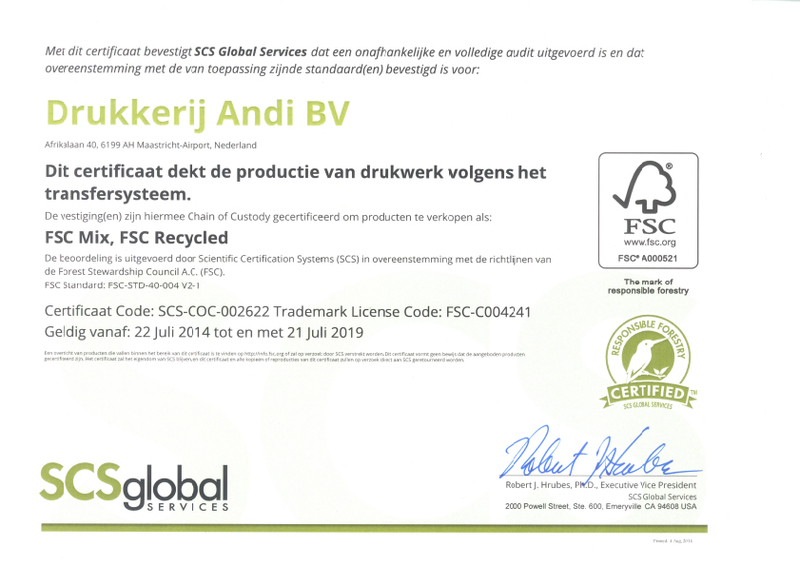 Andi is certified with FSC license number FSC-C004241. Sustainability is a high priority for us, as it surely is for you. High-quality, sustainable enterprise is top priority at Andi: taking responsibility for our actions, and choosing the options that are best for people, the environment and society. A key part of our policy is constantly seeking the right balance between the three cornerstones of corporate social responsibility (CSR): People, Planet and Profit. We aim to achieve a responsible balance between commercial success and social and ecological considerations – and every aspect of our operational management reflects that principle. The three cornerstones are integrated into our company’s identity, the Andi attitude and approach, our workforce, and our partners and suppliers. Our people are our company. They constitute the knowledge in our organization. That key resource is what ultimately creates added value: solutions that meet our clients’ needs. Sustainable, long-term employability, based on healthy employees who enjoy their work, is a high priority at Andi. Motivation and dedication are often even more important than background knowledge. At Andi, we primarily focus on what our people are best at and how we can deploy those competencies to optimal effect in our organization. In line with that focus, we also offer opportunities for people who are less well aligned with the job market to find ways to explore their full potential with us.